Cut the whole aubergine to half & bake it with seaoning & olive oil. Bake it until soft & scrap the inner flesh leaving the skin behind. or Prick the eggplant & roast them over open flame until soft & peel the skin & mash it gently. Heat oil in a pan,Add in the mustard seeds, split chenna dal ,fenugreek seed,whole red chillies, curry leaves & allow to temper. Add shallots & saute few mins. Soak the tamarind & squeeze the juice around 2 cups.Add the tamarind juice, salt & allow to boil. Add the mashed aubergine & allow to boil. Add the Gosthu powder,cooked dal & allow to cook. 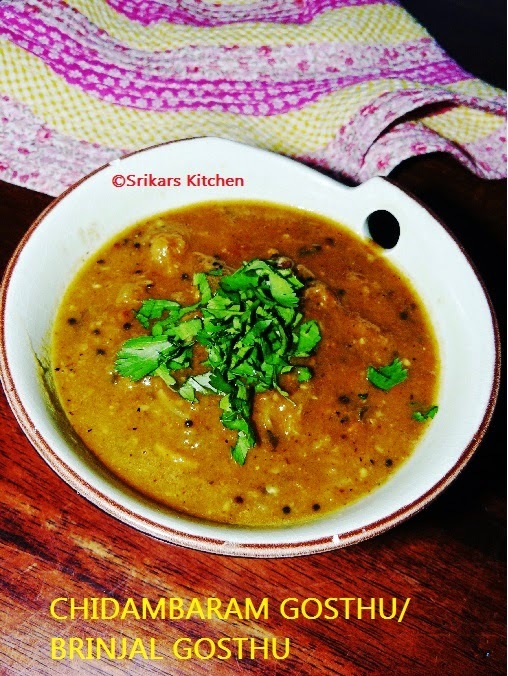 Serve hot garnished with cilantro.Serve with rice but the best combination is Pongal or Idly. Nice gosthu. My grandma makes gosthu for breakfast for idli with brinjal and potato..
Merry Christmas :) Food looks very yummy! Never heard of this.looking yummy.I will try this with idli. Yummmyy recipies..! Rekha, have posted a card for you in my blog, kindly check out! How delicious this looks! Anything with eggplants is always welcome in our kitchen. Lovely job. Rombo super'a irukku! I love Gosthu with dosais.